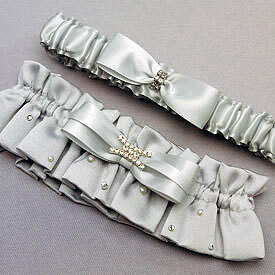 bride.ca | Bridal Fashion & Customs: Garters! Bridal Fashion & Customs: Garters! The traditional wedding garter toss was once believed to bring luck "by association" to whomever caught the garter - because anything the bride wore on her wedding day was believed to be lucky! Garters weren't always the only item of clothing wedding guests were after, however. Often, shreds of the bride's wedding gown were taken home for good luck as well! 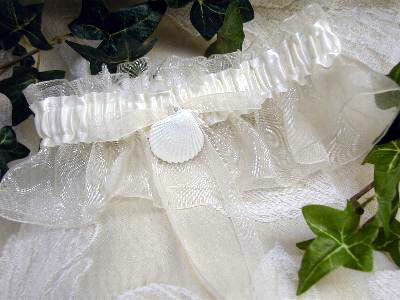 Since brides weren't too keen on having their wedding dress torn to pieces, the wedding garter was born: a designated "take home" article of the bride's clothing. 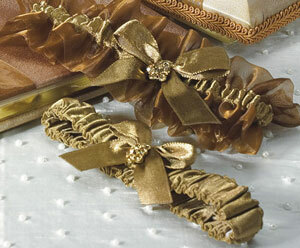 As garters have become more ornamental over the years, many brides now prefer to keep their garter as a keepsake. 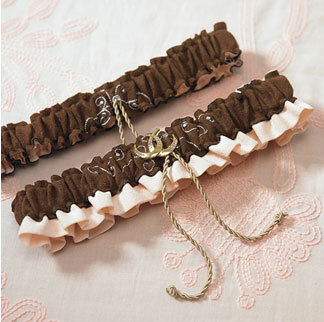 If a bride and groom still want to participate in the garter toss tradition but also want to keep the garter as a memento, they can use a "toss" garter which can be purchased alone, or along with a matching memento garter, sold as a set. "The following selection of garters are so unique you're sure to find more than just your "garden variety" (garter variety :-) ) garter!".. 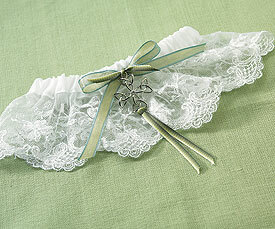 Celtic charm bridal garter, featuring a Celtic trinity knot attached with an olive and green ribbon. Embroidered Irish lace at the bottom adds a finishing touch, in keeping with the green Celtic theme! From A Beautiful Day's online store. 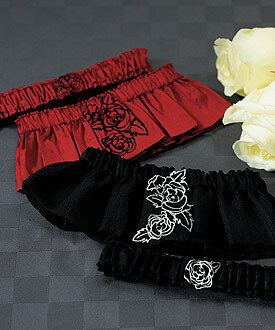 The "Fairy Tale Dreams" garter set. Embroidered with the phrase "And they lived happily ever after", the garter includes a magic glass slipper charm. From Traditions & Occasions, London Ontario. 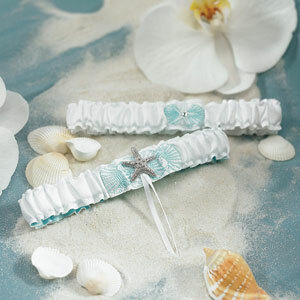 Perfect for a seaside beach wedding, the tiny seashell charm is a subtle accent to this white chiffon and satin garter. From the Thank You Company's online store. 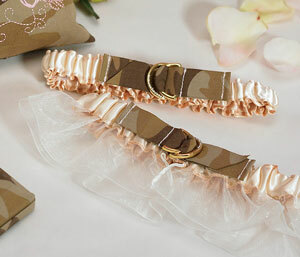 For the bootcamp bride, the "Discerning Camouflage" garter set features an eclectic mix of pretty pink fabric, gold and crystal accents, and camouflage! 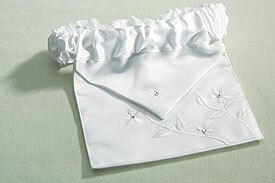 Also from Traditions & Occasions. 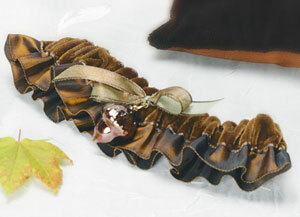 For the bride who has an acute attention to detail and is also a bit on the "nutty" side, the "Autumn Splendor" garter from Vancouver's Dreamgroup Boutique features an actual acorn preserved in shimmering copper and tied with fall-coloured ribbons. In Casa Gifts carries this garter featuring gold and crystal horseshoe charms tied with rope - to top off the western wedding theme! The water blue lining on the "Seaside Allure" garter set (also from Vancouver's Dreamgroup Boutique) provides something blue for the bride. Meanwhile, the silver starfish charm adds a touch of seaside bling! The "Platinum By Design" set from online boutique Finally the Bride, features layers of silver satin and intricate crystal beading. 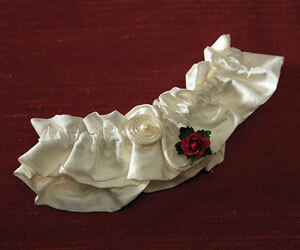 This "Flower of Love" garter from Traditions & Occasions is offset with a romantic red parchment rose. The "Silhouettes in Bloom"set from Paradise Style Group comes in Cabernet red or jet black, and features a rose silhouette. The "Chocolate & Strawberry Cream" set from Finally the Bride looks good enough to eat! 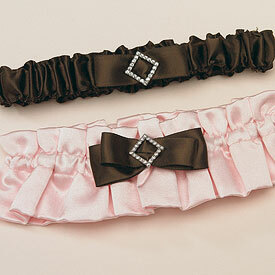 Satin and sheer bronze fabric adds a dramatic element to the "Bronze Elegance" garter set from Dreamgroup Boutique. The "Your Perfect Day" package from Nuptial Celebrations is a perfect way to wrap up your wedding day accessory shopping in one stop! 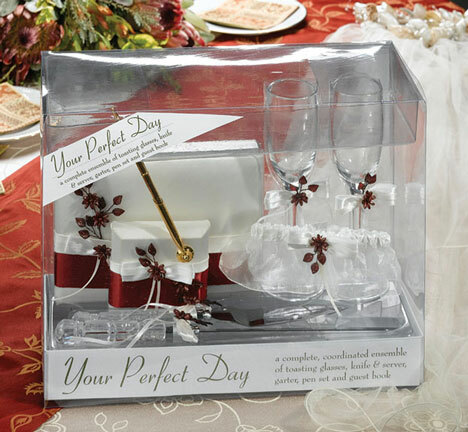 Shown here in Burgundy, the set includes a guest book, pen set, knife and server, and toasting glasses along with matching garter (you can also purchase a matching "toss" garter separately.) The Your Perfect Day package also comes in Brown, Light Blue, Light Peach, Pink, and Teal. This stunning white satin/silver pleated ribbon set includes a matching flower girl basket, ring bearer pillow and guest book with the garter. The Wedding Shoppe. 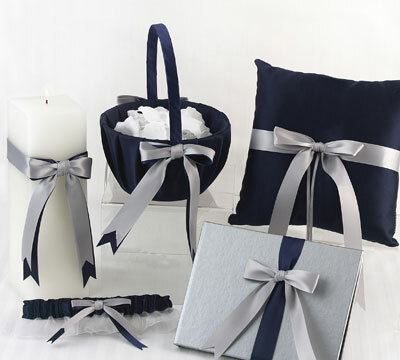 The navy and silver accessory set from InspirAsian Creations comes with matching flower girl basket, ring bearer's pillow, guest book, and unity candle along with the white chiffon ruffled garter. 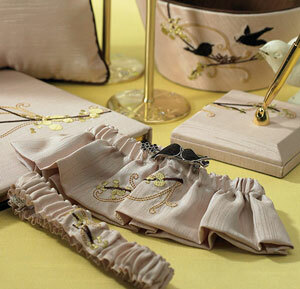 The "Love Bird" set features coordinated stationary to match its elegantly embroidered garter, decorated with removable love bird pin. Available at Dreamgroup Boutique.